Much has been made of the incredible interest in the World Cup here in the United States. The tournament on the whole averaged 4.5 million viewers over all 64 matches, a 36% increase from the 2010 World Cup four years ago. We also saw records smashed for single game viewership several times: the first was with the US-Portugal group match with 24.7 million, while the second was the Germany-Argentina Final with a total of 26.5 million viewers. Easily at an all-time high, the continuing upward trend in interest in the tournament and the sport in general has prompted many to ask questions like “Has soccer’s time come in the US?” and “What needs to be done for the sport to continue to grow?”. They’re pertinent questions, and ones that certainly need answering. Okay, so maybe I distorted that statement a little bit. But JFK’s most famous quote is incredibly relevant point when modified to address soccer’s situation in this country. If we — and I’m talking about the existing fans of soccer in this country — want to continue to see our favorite sport climb in popularity and gain the respect and recognition in the US, it’s on us to make that happen. Yup, soccer’s eventual success in this country comes down to you and me. It’s a pretty big burden, I know. Many of us have already taken on that responsibility prior to this point, too. But we need everyone to pitch in to lift this sport from the edge of the fringe and fully into the mainstream. You see, during the last few World Cups — at least dating back to 1994 — viewership and interest in the soccer spikes, and increasing fashion as mentioned above. Everyone catches fútbol fever for a few weeks, paints their faces, sings Olé olé olé and blows on their vuvuzelas. But interest then always quickly fades back off afterward, though usually not quite as far down as it had been beforehand. Part of that is our fault. 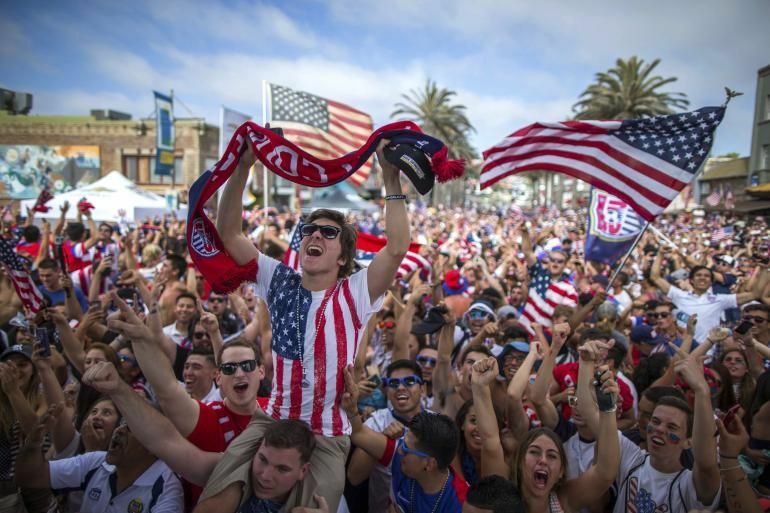 It’s easy to use the patriotic pride pumping through everyone’s blood during the World Cup to convince your non-soccer loving friends to come out and watch the US games. And the final itself has taken on Super Bowl-like importance as a sporting event for even non-soccer fans. But do you do the same soccer promotion once the tournament is over? Do you do so yourself? While some of us do, a great number of us don’t. It’s here where we can do our greatest work by taking a page out of my good friends at The Free Beer Movement‘s book. First and foremost, if you aren’t already, get out and support your local club — be it an MLS, NASL, USLPRO, PDL, NPSL, NWSL, WPSL or indoor side. There’s a club near damn near everyone in the country. Eurosnobs who complain that the US will never make it, or that we don’t have good enough players to compete how they would want, you’re part of the problem. Growing the game here in our own backyard will only serve to raise the overall level of our national team. going to your local club’s games, while maybe not european level on the pitch, can be a lot more fun than you would imagine. Sure, it might not be as good as your favorite European league’s level of play, but you might be surprised with how quickly you’ll come to enjoy it. Watching a game in person is always better. And if you’re making the trip, you may as well drag a non-soccer-committed friend with you. As the FBM has proven, promising a beer on your tab tends to be a great bargaining chip. And if supporting a local team just isn’t possible, watch a domestic league on the tube. While the World Cup’s ratings were booming, MLS and the lower leagues’ numbers are far from it. More viewers means increased ratings, and increased ratings means better TV deals, and better TV deals means better players in those leagues — which ultimately leads to a better national team. Supporting the American professional leagues isn’t the only solution, of course. Tote along a friend on a Saturday or Sunday morning to the closest soccer pub or invite them over to your place to watch the Premier League, Bundesliga, La Liga, Serie A, Ligue 1 — or any other European league. Point out American players in those leagues. Explain to them just why you love the game. And again, offer them a beer if necessary. Sign your kids up for youth soccer, if they’re not already. Playing the game as a child made me a lifelong fanatic, and your kids playing could do the same to them. Don’t buy them a beer though, until they turn 21 that is. You can also join a supporters group. Or get involved in the sport by coaching or refereeing. Start a blog and share it on Facebook or Twitter. Literally, do anything you can to continue letting everyone know why this sport is so freaking awesome. Whatever the course of action you decide to take is: do it soon, before the World Cup excitement drains out of your non-soccer loving friends’ consciousness. Just don’t let the interest die. That’s not really that hard of a task, now is it? So get out there, attend a match, watch a game, and let’s — you and I — drag soccer up to heights we’ve not yet seen on these shores.